Roundabouts, not to be confused with traffic circles, are becoming popular throughout the United States. The Bronx will get the first one in NYC. The insurance industry and FHWA consider them far safer than traffic lights and stop signs. "Once seen only in countries like France and Britain, the roundabout, favored by traffic engineers because it cuts congestion and reduces collisions and deaths, is experiencing rapid growth in the United States," writes technology reporter Eric Taub. New York State has gone from 18 in 2005 to 112 today. 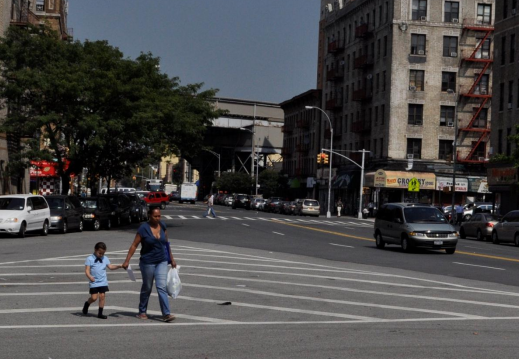 And New York City is getting its first one this month, when a three-way intersection in the Bronx that has been a challenge for pedestrians completes its conversion. Before: Intervale Avenue at Dawson Street was an asphalt expanse where crossing distances are up to 200 feet. Photo: DOT [PDF] via Streetsblog NYC. "The proposal is part of a larger road diet for Intervale Avenue in Longwood [PDF]," wrote Stephen Miller for Streetsblog NYC in February. "The plan was supported by a Bronx Community Board 2 committee in a 7-1 vote earlier this month." The plan would convert Dawson Street from one-way to two-way and add “splitter islands” to both divide traffic as it approaches the roundabout and give refuge to pedestrians. "Compared with stop signs and traffic lights, roundabouts are significantly safer, engineers say," writes Taub. "For example, crashes that result in serious injuries or death are reduced by 82 percent versus a two-way stop, and by 78 percent compared with an intersection with traffic lights, according to Jeff Shaw, the intersections program manager for the Federal Highway Administration." As Americans Figure Out the Roundabout, It Spreads Across the U.S.